The first of five ocean campaigns, co-sponsored with Maersk, bodes well for environmentally sustainable and economic recovery of metals. DeepGreen’s research vessel, the Maersk Launcher, will return to port in San Diego on June 4 with positive findings after nearly two months at sea. This is the first of five expeditions to pursue the development of deep ocean metals, which will be indispensable for powering a low-carbon and high-tech economy — battery storage systems, electric vehicles, smart phones, wind turbines and solar panels. The research results, carried out 4 km below the surface, confirm abundant seafloor polymetallic nodules, which prior analysis shows contain essential metals such as cobalt, nickel, copper and manganese. The ship is operated by DeepGreen’s subsidiary, Nauru Ocean Resources, Inc (NORI). 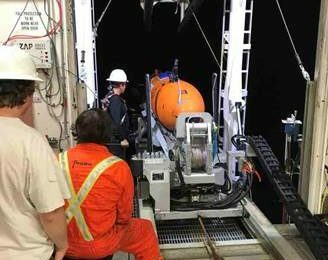 Read the full article here: DeepGreen research ship reports early positive findings of deep ocean metals.